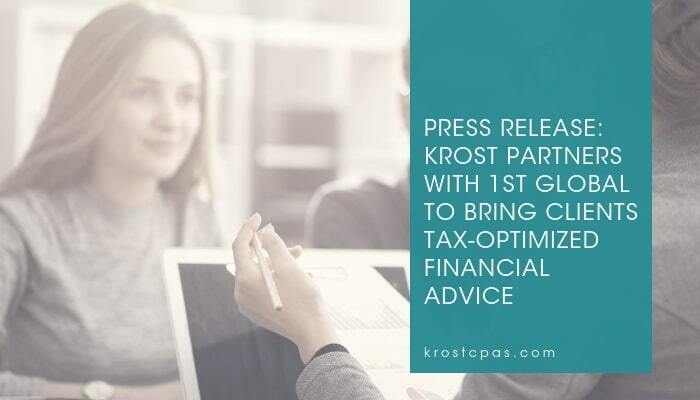 PASADENA, Calif. — Sept. 18, 2018 — KROST, a full-service certified public accounting and consulting firm based in Southern California, today announced a partnership with 1st Global to add wealth management services to its expansive suite of client offerings. KROST will combine the dynamic skills of CPAs with those of comprehensive financial planning to help its clients accumulate, protect and transfer wealth. 1st Global is an independent wealth management partner to exceptional CPA firms. Through the agreement, 1st Global will provide KROST with cutting-edge systems, expert coaching and flexible platforms to aide in the growth of its wealth management unit. KROST also announced it has brought on Philip Clark, a CERTIFIED FINANCIAL PLANNER™ professional with over a decade of experience in the financial services industry and expertise in key areas of comprehensive wealth management such as estate and tax consulting, insurance analysis, retirement planning and investment strategies. Clark, who joined the firm in May, will serve as Director of Wealth Management. The addition of wealth management is just the latest development for KROST, one of the fastest-growing accounting firms in America according to INSIDE Public Accounting’s “Best of the Best” listing for 2017. The firm’s rapid pace of growth has also been recognized by Accounting Today, where the firm ranked #13 among the fastest growing firms in the U.S. in 2017. 1st Global brings more than 25 years guiding enterprise CPA firms toward success in wealth management. Established in 1939 in Pasadena, California, KROST, is a full-service Certified Public Accounting and Consulting firm serving clients in the greater Los Angeles area. KROST offers specialized niche services in a narrow band of industries including the financial services, food service, manufacturing and distribution, real estate, entertainment, technology and not-for-profit sectors. Through its wealth management practice, KROST Wealth, the firm also offers financial planning and investment services to individuals, clients, families and businesses. 1st Global was founded in 1992 by CPAs who believe that accounting, tax and estate planning firms are uniquely qualified to provide comprehensive wealth management services to their clients. 1st Global provides CPA, tax and estate planning firms the education, technology, business-building framework and client solutions that make these firms leaders in their professions through dedicated professional client relationships built around wealth management. More than 400 firms have chosen to affiliate with 1st Global, making it one of the largest financial services partners for the tax, accounting and legal professions.